The word ‘cashmere’ has long been synonymous with incredible luxury – and expense. In recent years, however, the price for this high-end fiber has plummeted, to the point that you can stroll into your local craft store and pick up a skein with ‘cashmere’ on the label for less than the cost of a skein of glittery novelty yarn. On the surface, this seems like a good thing. Who doesn’t love a bargain on something special? But the lower price of this luxury fiber comes with a cost that you may not realize. ‘Cashmere’ is the downy undercoat of the of the cashmere goat. These goats are raised primarily in Mongolia, but also in Tibet, Iran, China, and India. In the cold of the high desert, their dense coats protect them from frigid winter temperatures, but in the spring they begin to shed. You may think that a goat would produce a sizable chunk of fiber, but in fact each goat produces only three or four ounces of usable cashmere annually – meaning that the cashmere in that sweater you found at the mall took three or four goats an entire year to grow. This means that in order to accommodate increasing demand, the herds needed to expand exponentially. Imagine: for each and every extra cashmere sweater made annually, four more goats need to be raised in the high Mongolian desert. As long as cashmere was a luxury product sold through a few suppliers, prices and demand remained generally stable, but the beginning of mass-production in China caused a drop in prices that caused a sharp spike in demand – which in turn spurred more production, shoving prices still lower. In 1995, only about 700,000 cashmere sweaters were imported to the United States from China; by 2005 that number had risen to more than 10.5 million. That’s 40 million additional goats introduced into a notoriously harsh and fragile ecosystem, and signs are increasing that the land just can’t take it. 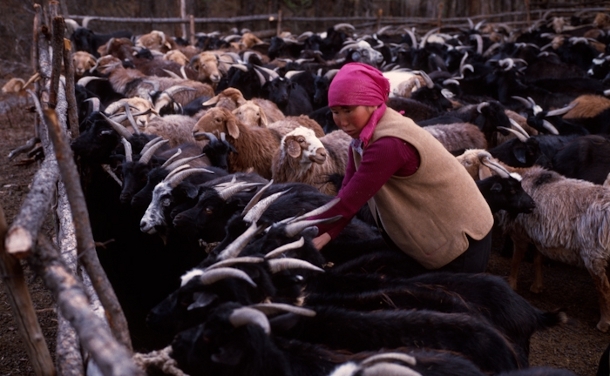 Traditionally, the nomadic Asian herders tended mixed herds – goats, camels, and sheep – but many have switched exclusively to goats for their lucrative coats. Unlike camels, whose broad, padded feet are gentle on the landscape, goats’ sharp hooves are thought to damage the root systems of the grasslands they graze on, allowing erosion to take place and the formerly green pastures to turn to desert. As millions upon millions of goats crowd upon limited land, the damage accelerates further. Dust, formerly held in place by the grass roots, is picked up by wind and blown into massive dust storms that choke Chinese cities and spark air pollution warnings as far away as Idaho. There’s bad news for the goats, too: with increased competition and spreading desert, food is becoming scarce. Fodder is being trucked in in an effort to sustain the herds, but fewer and fewer kids survive each spring. Hungry goats sprout coarser, lower-quality coats, which in turn fetch lower prices and reduce the ability of the herders to care for their animals. Despite the fact that something as simple as a cashmere sweater triggered this situation, it has now become a global issue with no easy solution. On a personal level, all we can do is take small steps and become more conscious of where our yarn comes from. Reclaiming yarn from secondhand cashmere sweaters, seeking out sustainable, eco-conscious cashmere produced in the United States or elsewhere (away from the Asian plains), or simply choosing a different fiber for a project are all ways to help stop the cascade of ecological damage in pursuit of the perfect fiber – even if it comes with a higher price tag. Melissa Mall is an at-home mom with four sons, and a new baby girl! They have settled in to a quiet (or “quiet,” if you like) rural life in Missouri and are enjoying doing things like gardening and keeping chickens in the backyard. 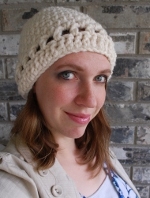 You can keep up with their ordinary adventures over at her blog, or take a peek at her crochet patterns and tutorials at Inner Child Crochet. Excellent article! I figured that the decreasing prices were a result of increased demand and wondered what (not if) ecological impact it was causing, but had not found a definitive explanation until now. Unfortunately, I don’t expect to see much change in this regard until the ability to raise more goats is severely impacted. Seems to be human nature. Thanks for this article. I don’t buy much cashmere, but if I do, I’ll definitely check the source. Thanks so much for the article. Seems to be the American way, nothing can be used sparingly, we tend to be on the selfish side. I also try to buy a substitute as you suggested. I love cashmere yarns! I’m pleased that you included the idea of recycling in your article. There are a number of good sources for recycled cashmere garments and yarns on line. Better that we make the yarns that are produced last and last than contribute to the problem. Pingback: Lavendelhexe » Wenn ich richtig….